Back in March 2010, Google acquired DocVerse and that company's technology to allow online collaboration on documents using the familiar tools of Microsoft Office. In November 2010, Google announced that it had (re) launched a beta test of the technology to a limited group of testers under the new name Google Cloud Connect. Today, Google Cloud Connect for Microsoft Office is available to all Windows users. By adding, "simultaneous collaboration, revision history, cloud sync, unique URLs and simple sharing to the Microsoft Word, Excel and Powerpoint applications," Google Cloud Connect for Microsoft Office allows people to continue using the desktop productivity tools they're familiar with to create and edit documents, but gain the advantages cloud-based collaboration. Google Cloud Connect for Microsoft Office is available as a free plug-in to Office 2003, 2007, and 2010 for Windows. Cloud Connect is not yet available for Mac operating systems. 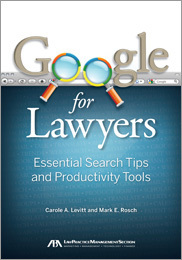 "Google For Lawyers: Essential Search Tips and Productivity Tools" is a hands-on guide to the Google tools, tips, and tricks that can help you work smarter...not harder.